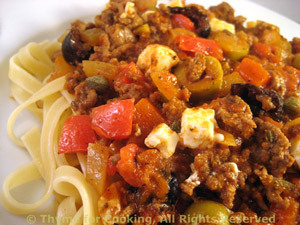 Pasta with Mediterranean Meat Sauce, Thyme for Cooking easy gourmet dinner. If you have leftover ham use it in place of the ground beef in the pasta. It's a non-traditional pasta sauce with the flavors of the countries surrounding the Mediterranean. Roll-cutting gives interesting looking pieces with lots of surface to be coated with this lovely sweet-sour, tarragon glaze. I came up with this recipe in the spring with my fresh tarragon, but it's just as good now, with the dried. Peel carrots and roll cut - that is cut the end off of the carrot at an angle, roll carrot 1/4 turn and cut next piece about 3/4 inch away at an angle, roll 1/4 and cut next piece, etc. 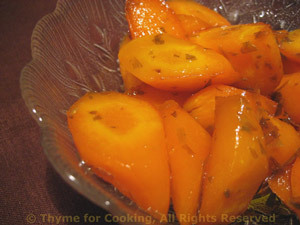 Put carrots in small sauté pan, add remaining ingredients, cover and simmer 15 - 20 minutes, until done. Stir occasionally. If they dry out add a bit more water. If they don't, uncover and cook off pan juices to finish. They should be just nicely glazed. Not tricky - just pay a bit of attention.